Powerseller Reveals Moron-Proof System to Smart Buyng On eBay... What If You Could Just Instantly Tap into A Powersellers Mind and Discover How You Can Immediately Start Buying on eBay Step-By-Step and Never Fall Into The Traps Savvy Buyers Find Themselves most Frequently and Find Deals At Riduculously Cheap Prices... Im Going To Show You Exactly How To Do This, And MORE! 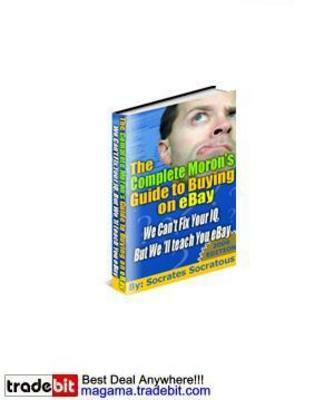 The Complete Morons Guide to Buying on eBay isnt a standard e-Book or how to document. It cant compare to anything youve ever come across online before! Its a simple and straightforward system that will have you buying exactly what you need and want and saving money on eBay in less mere hours Even if youve never bought anything from the Internet before! Dear Friend, Youve seen the news, heard it from friends, read the reports: eBay is a billion-dollar business, and everyone else is profiting from the online auction explosion except for you. However, you have no idea how, or where to start so that you dont get scammed, stolen from or stepped on. Its a bit scary to jump into the eBay auction waters unaware, not knowing where to look and how to find exactly what you are looking for. Sure, you could try and navigate the choppy waters yourself, but how many hard lessons will you have to learn first? Ive been exactly where youve been. When I first started off with eBay, I had no idea what I was doing. But with some guidance and support from other eBay Power Sellers (people who sell more than $1,000 on eBay on a monthly basis) and a couple of hard knocks of my own, I figured out what works and what doesnt. I now know that with the right information, some time and energy and a bit of direction from an expert, that even a complete moron could transform a potentially difficult eBay purchasing experience into a profitable pastime or money-saving endeavor. But do you know who to ask, and where to go to get this information? Of course not. Most people dont actually know someone FIRST HAND who can show them how to find the deals and avoid the scams when buying products and services on eBay. But you dont need to! Ive created an all-inclusive system for you that shows you the inside secrets and tips you need to be a huge success Secrets and tips Ive used consistently to find the best possible products for the least amount of cash, period. Some Of The Secrets Youll Learn: Find exactly what you are looking for in minutes without having to wade through hundreds of auctions or items. Get the BEST POSSIBLE PRICE for any item or service you need and want. Catch auctions at the last minute and make sure no one else can bid any higher than you have. Common misconceptions about buying on eBay, and how to use them to your advantage. All of the payment methods traditionally used with eBay auctions, and which is the best for you. Essential research tactics to ensure you are getting exactly what you are paying for. Ways to spot and avoid potential scams. And much, much more... Unlock The Secrets To Your eBay Success NOW! Your low investment for The Complete Morons Guide to Buying on eBay is just $47. Consider that this amount is less than what youll pay for most items listed on eBay right now, and a small portion of the profits youll gain from following the step by step instructions in The Complete Morons Guide to Buying on eBay. This system is one of the best bargains on the Internet today. Im sure youll agree. But there is something even more important to focus on. What you are getting is more than just an explanation of how to buy a product or service on eBay. It also includes a tremendous amount more than what youll find elsewhere. If you want to be successful like I am, you need a lot of targeted, useful information from someone who has learned from their mistakes and succeeded anyway in the eBay marketplace. You need to know exactly what to do, step-by-step, in order to beat the odds and save tons of cash buying the things you love. For a mere $47, youll get all of the aforementioned tools and tricks of the trade. Think of the value youll get from this system! But Wait ! Buy your copy of The Complete Morons Guide to Selling on eBay within the next 5 minutes , and Ill throw in my 24 Essential Tips For All eBay Sellers as a complimentary bonus section. I can easily charge another $27 extra for this information, But you can get it for FREE if you buy right now If you are still leery, please know Your Purchase Is Supported By My 60 Day Money Back GUARANTEE. You should be as delighted as I am with this system. But if you have any concerns at all with The Complete Morons Guide to Selling on eBay, I assure your satisfaction. For a whole sixty days. Two whole months! And all for only $47! CLICK HERE to get instant access to The Complete Morons Guide to Selling on eBay NOW. P.S. Still trying to decide if The Complete Morons Guide to Buying on eBay is what you are looking for? I know what you are going through. You dont know me from the guy on the street peddling his wares, and perhaps are a bit skeptical about buying something from a stranger. Well in addition to the 60 Day Money Back Guarantee, since you have read this far, let me add another special something to really get you really excited. P.S.S Buy your copy of The Complete Morons Guide to Buying on eBAy TODAY, and Ill throw in my 24 Essential Tips For All eBay Buyers as a complimentary bonus section. I can easily charge another $27 extra for this information, and you can get it for FREE if you buy right now. These 30 tips will give you the heads-up on the things to do, take note of and ensure whenever you bid on an auction anywhere. They are invaluable snippets of information that are hard to find anywhere else. All thirty are yours, FREE, if you sign up today!